Representatives of WATER, Women’s Ordination Conference, and Catholics for Choice stand in solidarity with Kate Kelly and Ordain Women. From Left to Right: Katie Breslin of Catholics for Choice, Ciara Chivers and Cathy Jaskey of WATER, Kate Conmy, Erin Saiz Hanna, and Jeannette Mulherin of Women’s Ordination Conference. 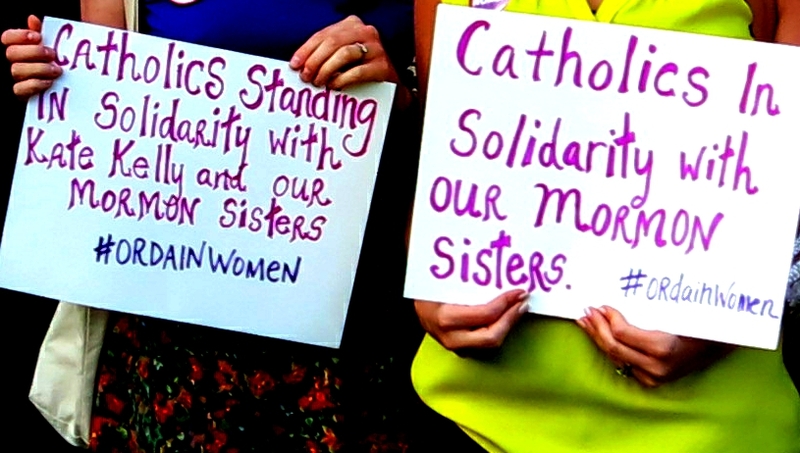 I am writing from the Women’s Alliance for Theology, Ethics, and Ritual (WATER) to express our support for Ordain Women in your efforts to actualize socially just standards of religious inclusion and gender justice in the church of Jesus Christ of Latter-Day Saints. We extend our support for you, and echo your call for the ordination of women and their full integration into the governance of the Church of Jesus Christ of Latter-Day Saints. As a network of justice-seekers that has worked for thirty-one years to create inclusive religious communities, WATER is honored to stand in solidarity with our sisters in the LDS community. We believe that complete inclusion in religious communities can only be actualized through equal treatment within the ecclesiastical sphere and its extended spiritual and communal spaces. 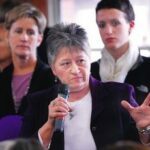 We affirm Ordain Women’s assertion that the right to define inclusion and doctrine within these spaces is inextricably tied to the positional and distinctly gendered authority of the priesthood as it currently exists. While there is a depth of potential to effect and uphold such standards of inclusion within the LDS Church, it is evident that women and members of the LGBTQ community have been historically and systematically deprived of their right to participate as full and equal partners in the LDS Church. We regret and reject the LDS Church’s threat of excommunication for you and John Dehlin who is doing important work for LGBTQ inclusion. We wish you well on the official proceedings and stand with you as you speak truth to power. We wish you personal support at this difficult time. But please know that as we celebrate the fortieth anniversary of the ordination of Episcopal women priests this month that your just cause will also one day find resolution. Ciara Chivers is a WATER summer intern. She is a 2014 graduate from Tufts University with a dual B.A. degree in Religion and Peace & Justice Studies.